For years Miranda viewed dog owners with some suspicion. She was bored by the way they only talked about their pooches, alarmed by their light coating of dog hair and troubled by their apparent comfort around excrement. But that all changed when, nine years ago, Miranda met Peggy. She was exceptionally cute (the dog), very smart (again, the dog) and they bonded from their first meeting. Since then, Miranda’s life has had its ups and downs – when they first met there was no such thing as a sitcom Miranda – and she candidly charts this in the book. No one has been more surprised than Miranda herself that it’s been her wonder dog who has taught her the best life lessons, taken her on hilarious adventures and become her smart talking but utterly loyal and loveable best friend. 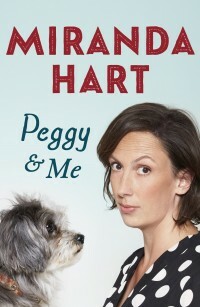 Multi- talented, writer and actor, Miranda Hart has now written a book about herself and her experience of becoming a dog owner. In her own inimitable style she documents the sometimes rocky but always love-filled road with Peggy. I thoroughly enjoyed watching some of the Miranda sitcom shows, and found while I was reading the book I had to go to You Tube to re-experience some of those very funny moments. Miranda Hart must be very tenacious, she already had this book written in 2013 and then lost it in a house burglary. Imagine the heart ache of losing something like that, hour upon hour of work. But… she began again and here we have the chronicles of Peggy and herself. Miranda began out unsure of whether she wanted to be a dog owner, but nine years on, she totally loves Peggy and dreads the day that all pet owners face, the day their beloved pet dies. However Peggy is still very much alive and bringing much joy to Miranda. I would love to see Miranda Hart in a debate for Dog versus Cat. She would of course take the dogs are best side of the argument and would be very convincing and funny. Cat owners you would have a very difficult time putting your side across! I laughed out loud so many times while reading this book. Mostly something funny would come out of the blue and I would just find a chuckle escaping. I cannot believe the escapades Miranda found herself in, along with poor Peggy who just sometimes had to put her paw over her eyes! When Miranda first obtains Peggy, she is still unknown – (Miranda that is), and it is in the following years that she becomes more of a well known name for her comedy and acting in both Miranda and Call the Midwives. She shares with us her vulnerabilities, her worries, her joys. Along the way with Peggy she learns and grows and becomes a bit of a philosopher as well. I am not a pet owner – for the very reasons of some of the ‘disasters’ that Miranda details in her book, and she is a braver woman than I. However I love the bond that she forms with Peggy and I do get the joy that pets can bring. Full of great humour, personal sharing and lessons about life, I found Peggy and Me a really enjoyable read. Also loved the little illustrations sprinkled throughout by Jenny Meldrum, totally adorable. This sounds like a funny memoir that I would like. I might not tell our cat when I read it. I do love the stories of pets and their owners…but do not have any of my own. I am not one who wants the responsibility. This sounds like a fun book, though. Thanks for sharing. Great review Kathryn. This sounds wonderful! I can't imagine having your book stolen! I'm glad she went on to publish anyway. It is sad to think my dog will be gone before me. We have our fun times though. Awe I want this one, thanks Kathryn!